Yes it’s a retreat for women only. Yes it’s either at the beach. Yes, it’s a date with Jesus. Yes, it is soul time. Yes, it is heart time with other women (don’t let that scare you). Yes, it is a deep breath, a belly laugh, a new vision, a creative outlet, even a few walls are torn down. It is worship and teaching. It is time to dream again. It’s Yes and Amen Retreat. We have amazing times, every time. Great place to be with God. Here in this holy space, women from all ages and stages overcome their dreaded fears of “other women” and we soak in the presence of God. And it changes us all. There is time to walk on the beach. Time to journal. Time to share thoughts and ideas. Time to be creative and stretch yourself. Time to pray for yourself and others. Maybe most of all, it is time to listen to the One our souls love. These retreats are the perfect place to hear him. In a very real way, this is time you set apart to be with God. And that in itself is profound. So you are formally invited. To step out, to draw near. To risk and be rewarded. But seriously, don’t wait too long. The spaces will go fast. Please Note. There are NO refunds. We have made financial obligations to reserve these properties. You may give your space or sell your space to someone else, but there will be no refunds. Should you be unable to attend, your payments will be used for ministry purposes and scholarship funds. Thank you for understanding. 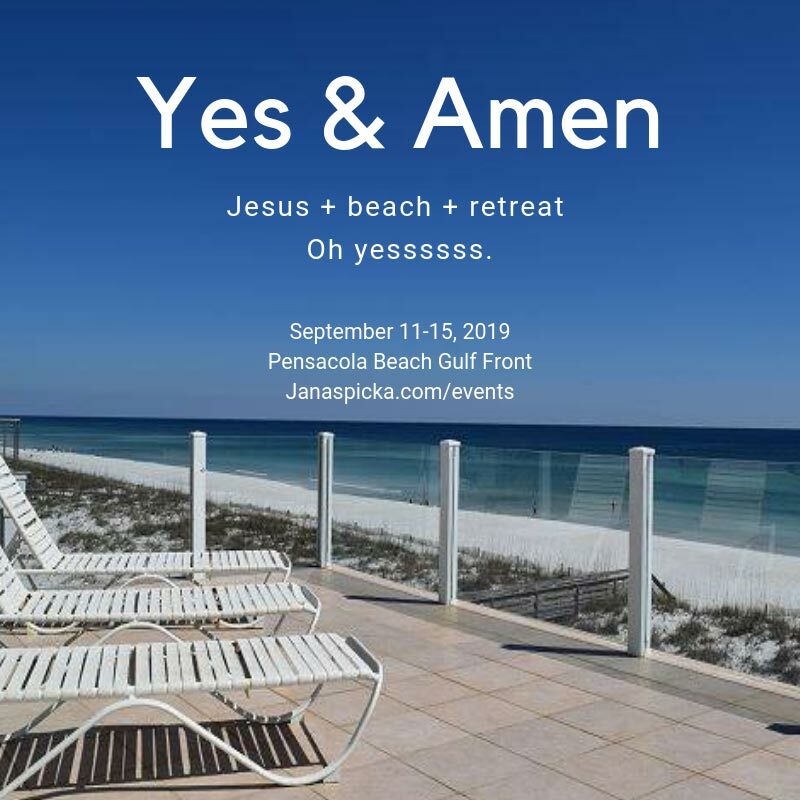 Women’s Yes and Amen at the Beach! CHECK OUT THIS NEW HOUSE! This beautiful beachfront home has all the goods plus a private pool. Pensacola is an easy 8 hour drive, or less. Wink. The beachfront retreat includes 3 or 4 nights, (depending on when you arrive), one home cooked meal, and all retreat materials and teaching. There are many restaurants nearby, or you can eat in. Or both. We will all bring assigned snacks or food items to share. Wednesday arrival between 5-9 pm only. Thursday free day or arrival. Sunday session 830 and checkout by 10. Please do not leave early as it takes all of us to check out. Look at the gorgeous house and then Register. It’s gonna go fast! All rooms come with private bathroom. This is first come-first serve. You may make full payment or 2 half payments or monthly payments. Final payments due by August 1. Again! There are no refunds, no exceptions. You may transfer or sell only. If you need a scholarship, please ask.